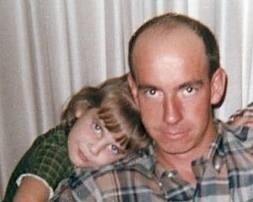 ~ Thoughts while looking at old photos of my Dad: Wow, Dad doesn’t have gray hair in this picture. And he’s still skinny. I wonder if we (kids) caused his gray hair and weight gain. No, wait a minute. He didn’t get gray hair and gain weight until after we all moved out. So, it must have been all Mom’s fault. What was I thinking? Me: Since tomorrow is Father’s Day and your father isn’t here, you two should spend money on me, instead. Son: U don’t get two days. Daughter: Yeah Mom, you don’t get two days. Me: Clearly we did not raise you two right. Daughter (to her brother): I think we turned out pretty awesome, don’t you think? Son: You should be nice to us since it’s Father’s Day and we don’t have a father any more. ~ To all of the Dads I know: I hope your day was special. ~ And to my Dad and Dave: I love you. I miss you. Happy Father’s Day. *In my defense, you should know that the hose handle will, occasionally and randomly, come back on after it’s turned off. I’m really only an airhead once in a while. Really. Update: My Mom won’t let me blame my Dad’s gray hair and whatnot on her. She says I have to blame heredity. Okay. Whatever. Good to know I’m not the only one who sprays herself in the face with the hose. My sprayer was badly designed with the weight at the trigger end so it lands on the trigger when you drop it. You would think by now I’d know not to drop it. Oh and widows with kids (young and old) should definitely get Father’s Day presents. We must have the same nozzle! I’ll let my kids know that I’m not the only one who thinks they should have showered me with gifts. 🙂 I’m sure they’ll appreciate me setting them straight on the matter. Thanks! I’ll say it… Happy “Two Days” to you! If you ever want to brush up on your car cleaning, there are plenty of Fish Vans for you to practice on! I very much enjoy your posts, thank you for sharing. John. Sorry I am late with this but – happy Father’s Day to you! Dave would be so proud of you, and I truly love reading your stuff. Thanks for sharing. I never thought of that before, but I think you may be right. Dave was always my biggest supporter and I have no doubt that he’s still proud of me. And still supporting me. And still reminding me how to wash a car. Windows, too! Thank you.